New Delhi: Hindu groups have moved the Supreme Court challenging the Centre’s acquisition of 67 acres of land surrounding the Ram Janmabhoomi-Babri Masjid disputed site in Ayodhya, which happened through an act of Parliament in 1993. The plea — filed by the Akhil Bharatiya Hindu Mahasabha and devotees of Lord Ram calling themselves the Sanathan Dharm — comes days after the Centre moved the top court seeking to “restore” the non-disputed “excess” land around the Ram Janmabhoomi site to its original owners. The two groups, in separate pleas, sought their right to worship on the land surrounding the disputed land. 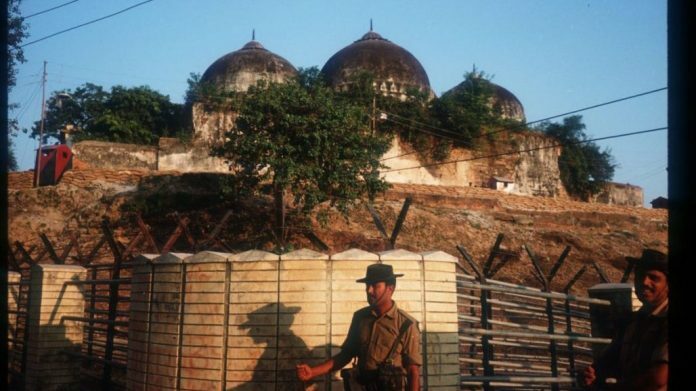 The dispute revolves around a plot less than three acres in size, but the central government took over around 67 acres of land through the Acquisition of Certain Area at Ayodhya Act, 1993, as a preventive tactic after the December 1992 riots over the demolition of the Babri Masjid. In his plea, Kamlesh Tiwari, chairman of the high powered committee of the Hindu Mahasabha, has also challenged the top court’s order that stayed the 2010 Allahabad High Court order which, in a 2:1 majority verdict, divided the disputed land between the three contesting parties — the Sunni Waqf Board, the Nirmohi Akhara and the deity, Ram Lalla. In his plea, Tiwari submitted that the political scenario in India is “running around” this issue, and it is in political interest to stall the construction of a Ram temple at the disputed site. The plea also seeks to vacate the status quo on the land surrounding the disputed site. It further submits that the ‘The Acquisition of Certain Area at Ayodhya Act, 1993’ (Central Act No.33 of 1993) infringes the Hindus’ right to worship. The organisations invoked their right under Article 25 seeking to re-establish past glory and restore the places of importance connected with religious sentiment of Hindus. They submitted that prayers and worship at historical temples like Manas Bhawan, Sankat Mochan Mandir, Ram Janmasthan Temple, Katha Mandap, Sita Ki Rasoi and Janki Mahal has been stopped as a result of the Centre’s acquisition of the land. Tiwari submitted that Parliament or a legislature has no power to infringe on a pilgrim’s right to worship at the disputed sites. “The Union or the states have no power to stop puja and other religious activities at such places,” the plea stated. The plea further said that no public purpose would be served by acquiring such a piece of large land at the “cost of religious sentiments of the Hindus”, and that all land owners of the Hindu places of worship jointly want the construction of the Ram Temple. The plea relies on a report by the Archaeological Survey of India that “proves that to the hilt that there was a temple in existence in the year 1528 when under the orders of invader Babur the temple was demolished and employing the material of demolished structure another structure was raised”. “The said land cannot be waqf land, and so no mosque can be constructed or can be presumed in existence at any point of time,” the plea said. Meanwhile, the Sanathan Dharm has submitted that the disputed site at Ayodhya is not only of religious importance to the Hindus, but it has historical importance as well. As such, the state has exclusive powers to act on this site. The state legislature has exclusive power to enact a law on those subjects and Parliament cannot encroach upon the state power to enact law, it contended.